Some of you might already knew that I am having some new plan for de Cor's Handmades, and writing a brand new series of tutorial instead of just about Wired Chinese Knot is part of the new plan. The Mini tutorial in MINI-TUTORIAL Series is not "mini" at all, it takes as much effort and time to write, though I did tried simplifying the steps and procedures in the tutorial, but I am just too use to detail out every single steps. So DCHMT002 - The 'A' Pendant, is introducing a wire-weaving technique to wrap up 3 core wires to form an alphabet 'A'. 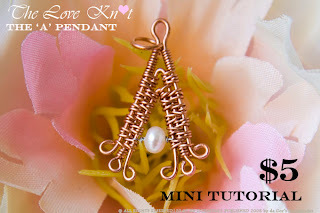 This tutorial caters for all level of people who does wire jewelry. The painstakingly made tutorial contains so much detail that any level of enthusiast is able to make the piece. PLEASE BE INFORMED THAT THE "ALL 6 TUTORIALS" does not include this tutorial. 1. Weaving technique in wrapping 3 heavier gauge of wires to form an alphabet "A". 2. Attach a bead when there isn't any room for a fine wires to go through, even though you are using the finest wires. The content in this tutorial including All pictures and text were taken and wrote by me. There are 3 major steps in making this 'A' Pendant, to deliver the clearest instruction, the beautifully taken pictures (including the coverpage) will provide you the means from end to end to make this 'A' Pendant. In this document, it also listed out the tools and materials being used. You can create them by just looking at those high-resolutions pictures. PLEASE DO NOT LEND TO OTHERS, SHARE AMONG FORUM, SHARE AMONG FRIENDS, COPY AND MASS PRODUCE THE PENDANT OUT OF IT. And if you would be so kind, please give a credit to me if my tutorial inspired you or helped you in your jewelry making journey, it would be greatly appreciated!